It’s that time of year to celebrate the holidays! 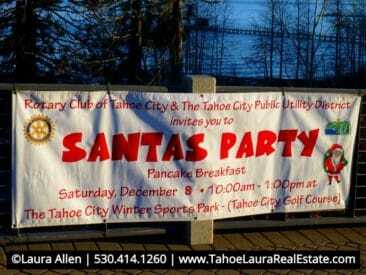 This Saturday, December 8, 2018, in Tahoe City, California,from 10 a.m. to 1 p.m. is the Rotary Club of Tahoe City and the Tahoe City Public Utility District annual Santa’s Party! A holiday party is a lot of winter fun with Santa, and at Santa’s Party, which will be held at the Tahoe City Winter Sports Park (also home to the Tahoe City Golf Course int the summer) will be the location of this annual event! Santa will arrive in style, on his fire truck at the Tahoe City Winter Sports Park in downtown Tahoe City followed by a pancake breakfast, cookie decorating, ice skating, sledding, and gifts from Santa for those children up to the age of ten (10)! In addition to getting to talk with Santa, there will be music, along with warm drinks and food. 251 North Lake Blvd., Tahoe City, California. For more information on Santa’s Party, at the Tahoe City Winter Sports Park, Contact 530.583.3440. The Rotary Club of Tahoe City and the Tahoe City Public Utility District are able to put this annual event on with a lot of help from the local community. Special thanks to: Sierra Sun, SaveMart, Tahoe Truckee Lumber, Geared for Games, Cafe Zenon, The Tahoe City Winter Sports Park, The Truckee Highway Patrol, The Placer County Sheriff’s Department, and the North Tahoe Fire Department. This year we have already have snow on the ground, so this years’ event should be a great winter party. 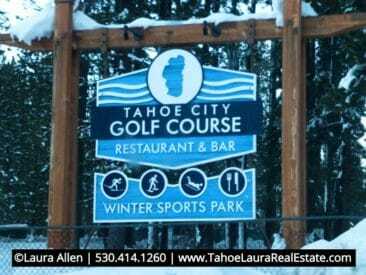 This is the third year that the Tahoe City area has had a seasonal ice rink, which opened has just opened at the Winter Sports Park, so there will be a lot of fun activities and things to do this year. Santa’s Party is open to the entire North Lake Tahoe community, and it’s free, so come out and enjoy a little holiday fun. Get ready to have a fun day with Santa, at Santa’s Party, on Saturday, December 8, 2018 in Tahoe City, California!